Sumeru Press Inc., 9781896559315, 384pp. 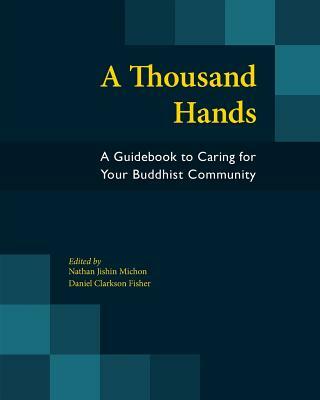 A Thousand Hands is an anthology of 50 articles by Buddhist chaplains, teachers, therapists, and social workers, presenting Buddhist approaches and resources designed to help community leaders respond to the many challenges brought to them by their communities. As a Buddhist community leader--or even a concerned community member--we may have read many sutras, practiced thousands of hours of meditation, or become well versed in Buddhist philosophy, but that does not prepare us for every situation we will face. It is very natural that people turn to a spiritual or religious community in times of trouble, and when such a person comes our hearts may fill with compassion and want to do whatever we can to ease their suffering. However, conversations with Buddhists in the West show that both training and resources in these areas are often lacking. This book is divided into three sections. The first deals primarily with ways to help one's self--ways to help develop one's capacity to be present in an effective way to help others in need, whether that is through listening more effectively or better organizing a group's money in order to keep a temple or organization stable. The second section is more about helping individuals with particular issues, such as cancer, divorce, anger, financial troubles, and depression. The third section contains chapters with broader community themes like group facilitation, leading projects, creating family programs, and volunteering. In each chapter, further resources, recommended reading, and relevant organizations are listed.